We thank you for helping us revise and update the GNU General Public License, from version 2 to version 3. We encourage you to continue helping us revise the FDLv2 and SFDL. 19 November 2007: The FSF just released the final version of the GNU Affero General Public License version 3. Again, our thanks to the community for providing feedback for the drafts of the license. 8 November 2007: The FSF Compliance Lab has published A Quick Guide to GPLv3, a developer-friendly article explaining the new features and benefits of GPLv3. Be sure to check it out. 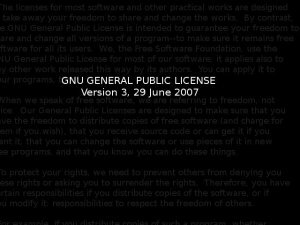 14 August 2007: The Free Software Foundation today released the second discussion draft of the GNU Affero General Public License (GNU AGPL). This license is based on GPLv3 with a new requirement to ensure that users who interact with the software over a network can receive the source for that program. Read more about the draft and provide your feedback. 2007 June 29: GPLv3 and LGPLv3 have been released! The final text of GPLv3 is accompanied with a rationale document explaining the few changes since the “Last Call” draft. The final text of LGPLv3 is available as well. Please see our press release. The GPL FAQ has already been updated with additional information, and we'll continue to improve it over the next few weeks. 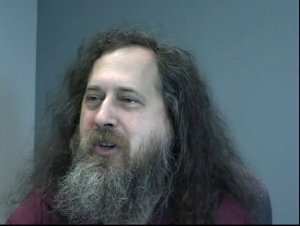 You can watch the video of Richard Stallman announcing the release and giving an overview of the major changes at the FSF's Boston office on June 29, 2007. AGPLv3, FDLv2, and SFDL are still being revised. We look forward to your feedback and support as we continue to develop these licenses.